Mackie, Ted and Kami Banks Kane recently received their Retailer of the Year award from the magazine ‘Beverage Dynamics’ during a June 4 conference in Denver. 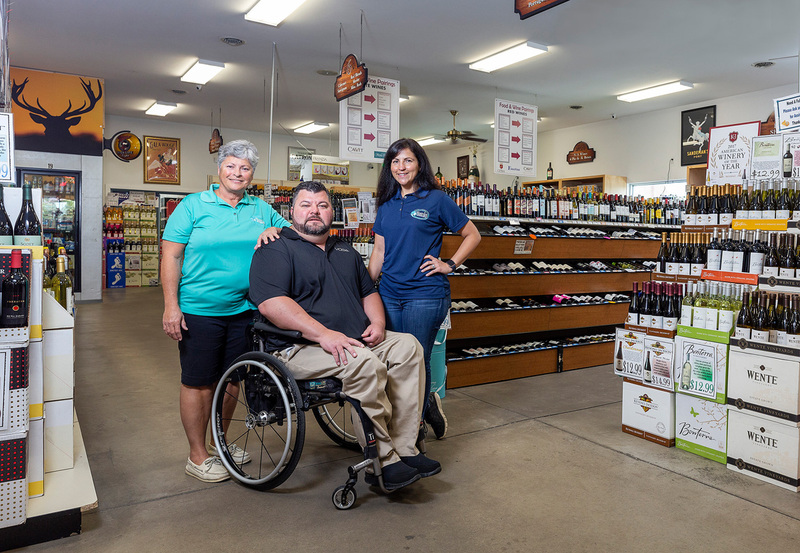 Banks Wines & Spirits in Millville has been named a Retailer of the Year for 2018 by the trade publication Beverage Dynamics. The magazine gives top honors to beverage retailers each year, and this year Banks is one of 17 retailers across the country to receive the title. Banks opened 15 years ago, under the ownership of Mackie and the late Russell Banks and their children, Ted Banks and Kami Banks Kane. Ted Banks said the family prides itself on customer service above all else. “Being owner-operated and hands-on is what sets us apart,” Banks said. Kane added that the staff at Banks Wines and Spirit receive training in product knowledge and customer service, and that makes a big difference in store quality. Year-round, the store has 18 employees; in the summer, that expands to 26. “We live in the community; we give back to the community; we’re very involved in the community,” Kane said. Kane also said the emphasis on customer service means the store is able to provide services such as planning beverage service for weddings and other events. Having Banks help plan what and how much to buy for special events “makes it an easy shopping experience for the customer,” she said. While the award is a nice way to celebrate 15 years of service, the family is not resting on its laurels. Plans to expand the store in the coming year are now in full swing. The addition of 3,000 square feet of warehouse space will not only allow for more efficient deliveries and more storage capacity, but will also result in changing the store configuration to double the current retail space, Banks said. “It will allow us to really open up our beer section,” Kane said. With the current craft-beer craze, “there are so many new products and so many new packages” to display, she said. Banks currently stocks about 3,000 wines and more than 300 different beers. Bourbon is also a hot commodity in beverage sales, and Kane said Banks has one of the largest selections of bourbon in Sussex County. “It’s really going to make the store so much more efficient,” Banks said of the addition. While a beer delivery typically can take as long as four hours with the current space, when the addition is complete, those times will decrease substantially, he said, meaning less time that delivery trucks are taking up parking lot area. Groundbreaking on the addition is expected within the coming months, Banks said. Banks and Kane received the Retailer of the Year award at a conference in Minneapolis on June 4. Each of the winning businesses is profiled in the May/June issue of Beverage Dynamics magazine. “It was really interesting. We learned a lot” at the conference, Banks said. Particularly interesting, he said, was information on using digital technology in stores to set up interactive displays, where customers can learn more about products based on their preferences. “We’re always watching the trends to see what’s happening in the industry,” Kane said. The pair also pride themselves on their creative displays for different holidays. Although businesses may nominate themselves for the yearly award, Banks was nominated by another Delaware liquor retailer, Peco’s Liquor Store in Wilmington. Banks Wines & Spirits is located at 38014 Town Center Drive, Millville.